I hope you aren't trying to change that light bulb, Mudpie! You have to turn it off first. Just be careful not to burn your paw. Maybe if you turn it off you can sleep better. Don't burn your paw, Mudpie! You are too cute Miss Mudpie. That is a cool lamp shade. Curious, indeed! So cute, Mudpie. Is there a moth in there? Are you trying to tell your mommy it's time for lights out, Mudpie? You are too cute! Uh oh. Is someone getting in trouble? 'Cause we know trouble and that looks like some to us. Wha oh! Trouble is a'brewing! We saw your doodle at https://fourleggedfurballs.blogspot.com/! Warning me NEVER to plug in a floor lamp in a room the cats can get into...currently the mud room has no electricity anyway, and office room has a desk lamp out of cats' reach. 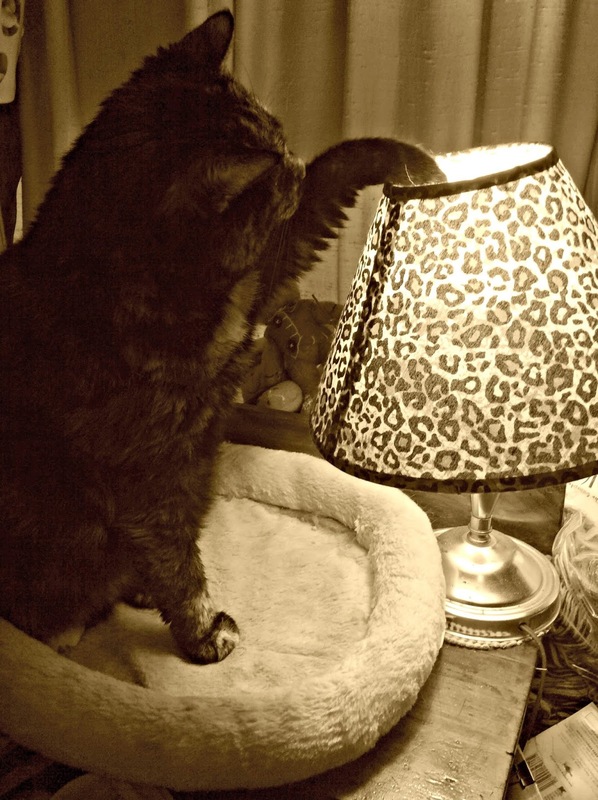 Maybe one of those little bugs flew into the lamp shade again. Like they always do. Just be careful and don't burn your little paw. Have a great day. HAH! What Summer said! That lamp would go with Pop's sheets. Careful, Mudpie! Those light bulbs get hot! I don't think your superheroine powers stretch that far Miss Sizzlepaws.